Mem Fox + Judy Horacek, Where is the Green Sheep? Having two children has taught me a lot about narrative. With the first child (my boy, McCool, now almost four), we did everything by the book, so to speak. We settled on a bedtime routine quickly, milk and three books. He was read up to ten books a day (and still is). He is fascinated by story, able to sit still and focus on the words, the detail. He is usually reluctant to read a new book, preferring to have one on endless repeat until he has memorised it and can read it himself. With the second child (my girl, GG, now 18 months), the routine flew out the window from day one. She has absorbed the books, as part of us reading to McCool. She now sits on her own for a long time, looking at them in the corner. She brings favourites over to me at all times of the day. She still gets at least ten books but usually in bursts of passion (mine and hers). She is more interested in turning the pages, in noises and flaps, in dashing to the last page to see what happens. The only way I can get her to lie still when I change her nappy is to give her a choice of books. But there’s no doubt that, regardless of their very different personalities, they both are drawn again and again to the same books. Sometimes books I’m truly in love with (the classics: Where the Wild Things Are; The Very Hungry Caterpillar); sometimes books I wish I never had to lay eyes on again (most of the mass-marketed Wiggles variations). We’re lucky in Australia to have access to such a wide range of wonderful children’s book writers and illustrators (and publishers willing to look after them). My favourite thing is emptying the children’s piggy banks and being left to my own devices in the picture book section of a bookstore like Gleebooks in Sydney to wander and browse. Here are the top 5 books in our household that have stood the test of time — for both the kids and me. These are the ones where I’m still able (after hundreds of readings) to truly enjoy turning the pages, to discover something new each time I read it. Mem Fox and Judy Horacek’s book is a masterpiece of narrative. I’ve learnt that children love Q+A. As I read ‘But where is the green sheep?’ my daughter answers ‘Mmmmm’ each time, enjoying the to and fro between us. The simple images give lots of chance for singing and acting the fool (the clown sheep, the sheep swinging around a lamp-post) and build in momentum to a climax, a page with a riot of sheep — Ned Kelly, Carmen Miranda, the ‘narcissist’ sheep — offering me the chance to branch off into all kinds of other narratives, before I start to whisper, and we find the little green sheep, sleeping and peaceful. The publishers, in all their marketing glory, decided to sell a soft toy of the green sheep, but my kids would never touch it. I always like to think they preferred the green sheep to be lost, missing, in their imaginations; they didn’t want to see it on their shelves. Mem Fox (she has contributed to so many wonderful books) and Helen Oxenbury’s tale of inclusion holds absolute delight for babies and toddlers. GG’s favourite word of the moment is ‘baby’ and in this book she sees herself reflected on every page, especially when there are actual illustrations of hands, fingers, feet, toes that she can measure her own against. The repetition gives her a chance to learn, and also the opportunity to see kids from different cultures to her own (she loves the image of the child with the penguin in the snow; and the child with the chicken in the heat). The personal link at the end where the mother kisses her baby three times on the ‘tip of its nose’ gives me lots of opportunities to kiss and tickle too. Sonya Hartnett’s foray into children’s picture books is, like everything else she does, unusual, with beautiful illustrations by Lucia Masciullo. It’s a melancholy tale of a boy on his own (his mum not mentioned, his dad away at sea). His father is an inventor and invents a toy for him, but this toy is jealous and starts destroying the boy’s world. The boy soon figures out there’s something not quite right and works out a way to trick the toy, creating a model of himself as a decoy. McCool has always loved this tale. He’s an independent boy, too, looking for answers, and this book elicits loads of questions: What is the toy doing? Where has the dad gone? What’s an inventor? This is my favourite children’s picture book of all time. I’ve no doubt handed down my passion, but both the kids love it. Jenny Wagner and Ron Brooks’ narrative proves once and for all that the dark and mysterious have a place in children’s books, even those for very young kids. The glorious illustrations and the apparently simple narrative (that is, in the end, about approaching death) of friendship and loyalty means the book can be savoured on many levels. Just the opening page before the story begins is full of wonderful possibilities: the outside toilet (McCool is fascinated by this idea), the chicken coop, the tyre swing, the old car in the garage that doesn’t get driven, the black cat that’s always lurking. I have to hold back tears nearly every time I get to the page where John Brown, the sheepdog, is lying with Rose’s slippers, wondering why she won’t get up. It’s a lesson in pared-back, taut and controlled writing. Magnificent! Pamela Allen, like Mem Fox, writes and illustrates classic after classic: the list is remarkable (others that we call favourites include the Mr McGee series, Black Dog, Shhh! Little Mouse, Waddle Giggle Gargle, Inside Mary Elizabeth’s House) and she makes it look easy (it isn’t, I’ve tried). Who Sank the Boat? again focuses on repetition and refrain, asking a question so that the kids can answer. All kids seem to be drawn to the tiny in narrative (the small creature, the speck of dust, the littlest battling against the biggest [us adults]) and the idea that it is the smallest of all (the mouse rather than the donkey) who causes the commotion, who sinks the boat, is a clever trick and source of wonderment that never seems to grow stale. Pamela Allen, Who Sank the Boat? WHAT ABOUT YOU? WHAT ARE YOUR FAVOURITE AUSTRALIAN CHILDREN’S PICTURE BOOKS? OR THE ONES YOUR KIDS LOVE? Writing Mothers series: interviews on how to juggle writing with motherhood including the authors Anna Funder, Kirsten Tranter and Debra Adelaide. “Dougal, the garbage dump bear” is still an all time favourite. Even with the 10 year old who received it as a gift when he was 18 months old. All 3 seem to love it equally! My two girls (3.5 years & 15 months) have been similar. The older one loved everything, the younger one, loves books (particularly flaps at the moment) but is harder to please. If she doesn’t want to read the chosen book, she throws it on the floor! I find Alison Lester to be good value – we’ve been reading Moo to my younger daughter and The Magic Journey to my older daughter. We’ve also read another good Sonya Hartnett picture book called Come Down Cat. We’ve got Imagine which I think is by Alison Lester. It’s that beautiful detail they return to again and again. I didn’t know Sonya Hartnett had done other picture books so I look forward to reading Come Down Cat. Just got this message from Mem Fox’s assistant *so chuffed*: Mem was ecstatic to read your blog earlier today … She wanted me to thank you profusely and to tell you that four of your five books are favourites of hers as well: her two (!! ), John Brown Rose and the Midnight Cat and Who Sank the Boat? She cares for her two and half year old grandson every day so she is a ‘young mother’ like you, at the age of 66, and deeply into picture books, as you can imagine. She hopes McCool and GG and you will love her new book, another collaboration with Judy Horacek, called Goodnight Sleep Tight, which came out just two weeks ago. You are on the cutting edge having heard about it before its formal launch next weekend in Melbourne. We love Pamela Allen’s “A Lion In the Night”! 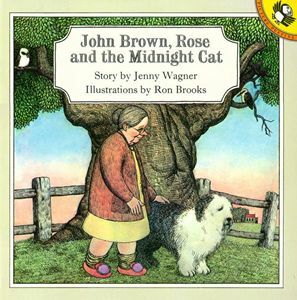 And I have always loved “John Brown Rose adn the Midnight Cat”. A favourite in our hosue is Shaun Tan’s “the Red Tree”. It’s incredibly beautiful. And for the record – I don’t freakin’ care where the green sheep is!!! Ha ha! Over it? I’ve always loved Shaun Tan’s work but haven’t seen that one. Will check it out. The Boy and the Toy is an absolute favourite of ours too. My kids have also loved Mem Fox’s Wombat Divine and Margaret Wild’s Miss Lily’s Fabulous Pink Feather Boa, both are which are illustrated by Kerry Argent, who I think is amazing. Roland Harvey’s The Beach is another one they can pore over for hours and Kisses for Daddy, by Frances Watts, is another book with a beautiful story and gorgeous illustrations. I hadn’t heard of John Brown, Rose and the Midnight Cat but that’ll be our next loan from the library! Thanks for those tips! We also have Wombat Divine, which is great. I’ll check out those others. Need to join our library – have just moved. We tend to have so many books in the house I don’t get to the library, but will! I read “The Bunyip of Berkeley’s Creek” (also by Wagner & Brooks) to my little guy’s Grade 2 class last year. I first read this book as a child and It was interesting to see the response to it by a different generation of children. This generation is not taught about “Australian culture” in the self consciousl and didactic way that mine was. And interestingly, no one in the class had any prior knowledge of what a bunyip or a billabong was. I’ve always assumed that the central tension of the book (for Australian children at least) relied on the bunyip iso firmly established in Australian folklore, ie. Alll Australian children know what a bunyip is while also knowing that it doesn’t “really” exist. Still, the kids loved the book! They found the bunyip very endearing and were fascinated by him as a character. That’s so weird you mention that book. When I was around three or four I was absolutely terrified of the bunyip emerging out of the depths, so much so that I would NOT ever let my mum get to the end of the book. I would make her stop or cry a lot. I couldn’t bear to see the last page, where I think the bunyip appears. I still feel scared thinking about it. I recently found that book and thought I should read it to my kids. But something scared me:-) It certainly struck a nerve with me. I can’t remember having that reaction about any other picture book. There’s something very eerie about the empty landscape too in the Bunyip too. Everywhere there are signs of human civilisation falling in decline, but so few living creatures. I found Jonh Brown, Rose & the Midnight Cat more scary as child though. I heard later that in the original version Rose did not recover and the book ends with Rose’s feet on the bed in the background while John Brown sits up at the table drinking a cup of tea. Actually, that ending for John Rose makes more sense to me. I always saw the black cat as representing ‘death’, trying to visit Rose, not frightening, but a sign, so that would fit. I guess as it stands, it appears a happy ending for kids, but there’s so much melancholy in those final pages. When it comes to Australian children’s picture books, we are huge fans of Tohby Riddle and Colin Thompson. See here for some of their books we love http://greatbalancingact.wordpress.com/2012/06/04/childish-things-and-death/ We also love Alison Lester’s books and both the Mem Fox/Judy Horacek Where is the Green Sheep? and Judy’s solo project The Story of Growl.